I posted links to the live streaming of the Miss Universe 2015 pageant night and my social media feeds is still hot with all the opinions and video clips about the event. I would consider it as one of the most controversial and probably the reason for some people, especially Miss Colombia, to be scarred for life. You see, Miss Colombia was announced as the winner of the pageant and was given the sash, the bouquet and the $300,000 DIC crown and was already basking in the glory of her winning above all the other 79 contestants only to be told that she wasn't the winner. 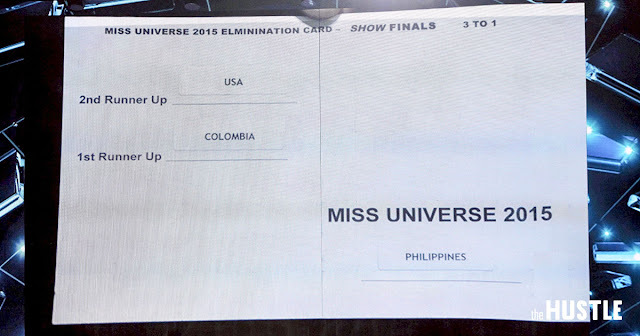 Miss Philippines, under a state of shock and disbelief, was then declared as the rightful winner. 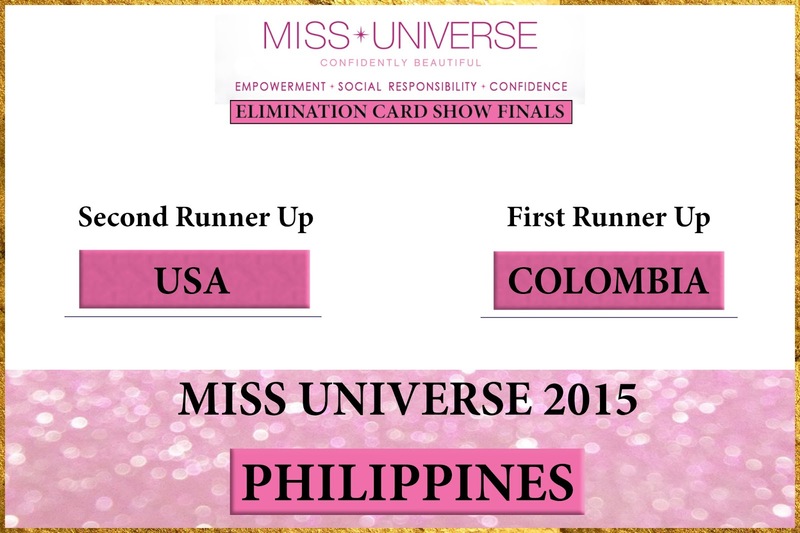 This blog post will not be tackling the whole drama that shook the pageant world though, I would like to blog about the design of the results card which I think was the reason why Steve Harvey misread (if this is isn't at all just a publicity stunt) and announced the winner incorrectly. I'm not sure what the significance of 3 TO 1 was. Maybe 3rd place to 1st place? Then again you will see 2nd runner up and so on so it may not be that. Too much white space - this is not a book or a minimalistic blog or a post card. The Miss Universe 2015 placement looked like a footer for the page. - looked like the space was meant to be someone eliminated (trash bin). Font is too small for someone to read in a very well-lighted stage. The font sizes are all over the place as well. Overall, the document looked so elementary and not well thought of. As the results card is something that is new for the pageant host, he should have been briefed beforehand who lost and who won before announcing the rightful winner. Or better yet, just have two hosts - after all two heads are better than one. Although this doesn't really apply to contests that only look for the most #confidentlybeautiful contestant. At the end of the day, design matters! Function and form of the design should go hand-in-hand in a document/material as important as this. Let me know what you think. My heartfelt congratulations goes out to Miss Philippines for being adjudged as the new Miss Universe. She may be robbed of her crowning moment but she has the whole year to relish her dream come true. She deserves the title and the crown this I dare say no doubt! This design I really like. Maybe they could give the host 3 cards next time and each card would look like this - complete with the contestants name and picture as well as country. Yeah? NOTE: Fonts used in the suggested design can be found here.